BARBARA JOAN BAUGH, 92, of Linton, Indiana passed away at 1:58 p.m. Monday, January 28, 2019 in Greene County General Hospital, Linton, IN. She was born December 15, 1926 in Terre Haute, IN to Orville A. Bowne and Wilma (Kester) Bowne. Barbara was preceded in death by her parents; brothers, Robert Bowne, Phillip Bowne. Barbara was a homemaker and taught Home Economics at Prairie Creek. She had attended the Presbyterian Church in New Bern, NC. Barbara liked to paint with oil and water colors and enjoyed sewing and cooking. ROBERT A. “BOB” BAUGH, 93, of Linton, Indiana passed away at 11:40 p.m. Thursday, January 31, 2019 in Regional Hospital, Terre Haute, IN. He was born February 13, 1925 in Terre Haute, IN to Henry Baugh and Mildred (Chamberlain) Baugh. Bob and Barbara were married on June 25, 1949 and celebrated 69 years of marriage. Sadly Barbara passed away shortly before Bob on January 28, 2019. Survivors include their children, Cynthia A. (Baugh) Thorlton (Dan) of Linton, Sallie J. Baugh (Peter Julian) of Chandler, AZ; grandson, Timothy Thorlton of Bloomington, IN. Bob was preceded in death by his parents; wife, Barbara. Bob was a Purdue grad and chemical engineer for 40 years. He also had attended the Presbyterian Church in New Bern, NC. He was a U.S. Navy Veteran of WWII. Bob enjoyed playing golf, watching TV and working crossword puzzles in ink. Arrangements are entrusted to the Cox Funeral Home; 218 South Meridian Street; Jasonville, Indiana. 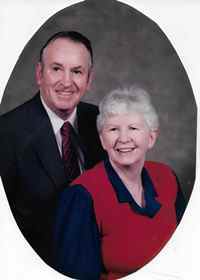 A Double Visitation is scheduled for Barbara and Bob from 4:30 to 6:30 p.m. Monday and 10 to 11 a.m. service time Tuesday at the Funeral Home. Double Funeral Services are 11 a.m. Tuesday, February 5, 2019 at the Cox Funeral Home with Pastor Mark Messmer officiating. Their Interment will be at Lebanon Cemetery in Midland, IN.